Prestige Rosé Champagne. With aromas of summer berries and pink grapefruit, aditionalists would serve G.H.MUMM Rosé with summer berry desserts. However, dominant notes of strawberry, cherry and redcurrant, mean it is also a delicious match for seafood (grilled lobster, marinated salmon) and ethnic dishes (tajines). 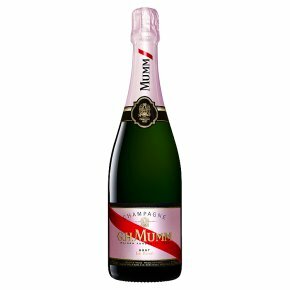 G.H.MUMM's very first rosé champagne was made in the 1860s, today this lively, energetic wine is a beautiful example of the House's Pinot Noir style - elegant, with strength and character.